Improves color results and durability. A pigment binding product especially designed for use with red tones of hair color. 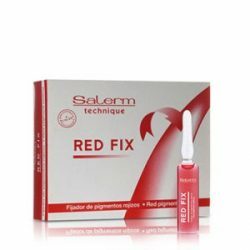 Red Fix is a cosmetic fluid that binds pigments, improving initial results and making color last longer and can be used with any hair color on the market. Helps make color last longer by bonding the color pigments to the innermost core of the hair’s cortex during color application. Improves and protects color stability against washing and other color fading agents.